Bran Symondson is a conceptual artist and photographer inspired by his experiences while serving in the Special Forces in Afghanistan. Bran turns the most prolific weapon in the world – the AK47 – into engaging works of art, masterfully embellished with dollar bills, iconography and butterflies. These works rest on a simple premise: take something of fear and loathing and turn it into something of beauty and intrigue. For Symondson, the Dollar is an iconic product within the world as it conjures up a variety of elements ranging from human emotions and behaviors to its influence and place in time. In his work Deuces, an AK47 swathed in American $2 bills, the artist asks the viewer to consider the juxtaposition of currency and the AK47 as it offers an idea of similarity in how each are perceived and used to affect people's lives yet the weapon and currency are both frozen in time and keep their identity but are never to be used again. Bran Symondson was the winner of the 2011 Amnesty International Media Award for his exhibition The Best View of Heaven is from Hell. 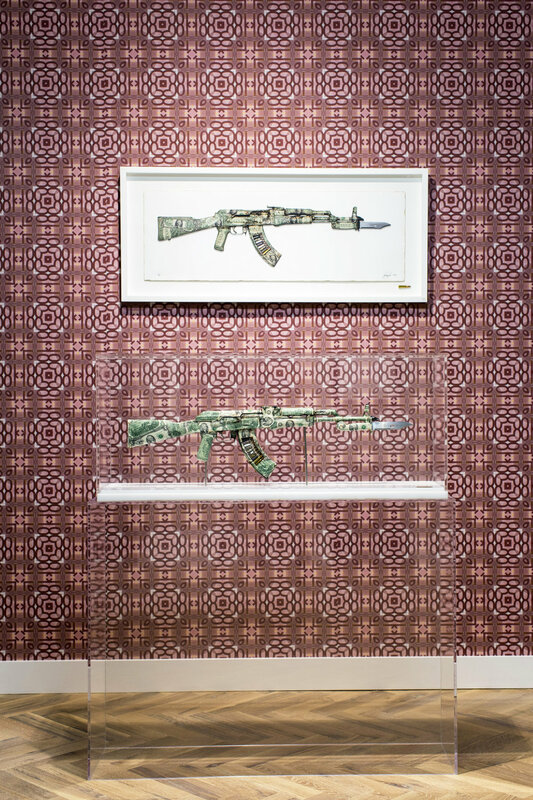 In 2012 for his exhibition, AKA Peace, Symondson asked artists such as Damian Hirst, Antony Gormley, Harland Miller, Sarah Lucas, the Chapman Brothers, Marc Quinn, Sam Taylor-Johnson and Mat Collishaw to reinterpret AK-47 assault rifles and the show completely sold out. His client list includes notable persons Sir Elton John, HRH Prince Khalifa of Bahrain, Dana White (President of UFC), John Caudwell & Jake Chapman. Brans work has been featured within exhibitions at the London Portrait Gallery, Saatchi Gallery, ICA, Phillips De Pury, various galleries in London’s Mayfair and La Colombe d’Or in Houston, Texas. He is a regular contributor to GQ Magazine and The Sunday Times (UK).